The series starts in the year 2009. The last ten years have been a turbulent time for humanity. In 1999, an alien space battleship crash lands on Earth and this touches off a war that ends with the UN unifying the world into a single world government. At the same time, humanity also works to repair the alien spaceship so it can defend Earth against threats from space. After a decade of work, the Macross is ready to begin it’s role of protecting humanity, but, an accident occurs during it’s launch and humanity is horrified to find itself at war with the Zentradi, a genetically engineered race of giants who only know war and conquest. With millions of ships at their disposal, nothing seems to be able to stop the Zentradi from extinguishing humanity’s hope for continued survival, until, by chance, the people of Earth discover a secret weapon that may hold the key to keeping humanity alive – the singing talent of a teenage girl. I can imagine what a revelation Macross was when it began it’s 36 episode run back in 1982 because, for a lot of the same reasons, it would still be a revelation if it began airing in 2017. This might be the point that I most want to convey about Macross. I worried I might react to Macross like those kids that were introduced to Harry Potter first and decided that Lord of the Rings was the derivative work that copied off of Harry Potter. In 2017, there is a much greater diversity of stories that get made into anime. 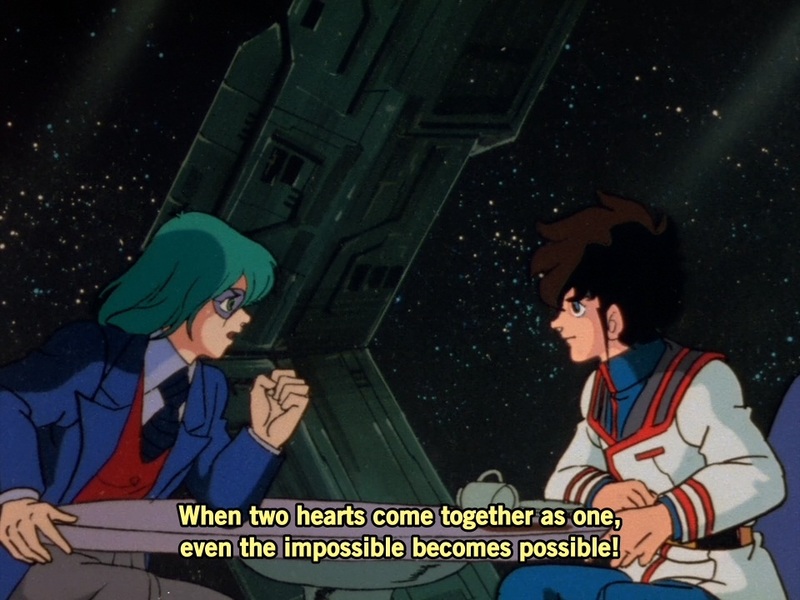 Anime about idols are now common and, since Macross was first created, there’s been decades of mecha series and romance series which feature a love triangle. Also in the decades since, the creator of Macross, Shoji Kawamori, went on to create the Aquarion franchise and the AKB0048 series which use some of the same ideas in some of the same ways. So, Macross should have felt like a retread and yet it didn’t. The first reason is the story in Macross explores a very interesting first contact scenario and it’s resulting culture shock. Cultural superiority is normally thought to go in hand with technological superiority. Here, however, each side is innumerably superior to the other in one aspect and profoundly deficient in the other. Humans have their culture and the Zentradi have their technology and a near infinite number of space ships at their disposal. The two seem mismatched until it sinks in how fragile the stunted Zentradi society is once it begins to react to humanity and it’s culture. Over the many millennium that the cloned Zentradi race carried out their war-making they did not deviate from how they were constructed. 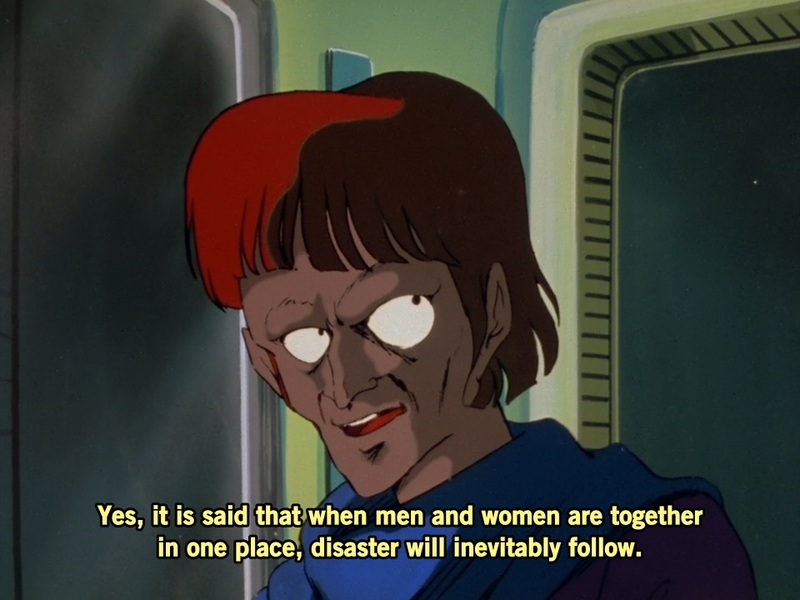 They were prohibited from having culture, the genders were segregated (the female army/navy protected the bases and the male army/navy did the conquering and invading), they were not allowed to learn skills beyond basic war skills, and only the leaders of the Zentradi were allowed to develop mentally beyond the level of an elementary aged kid. The third reason is the story in Macross does not always go in the most likely direction. I’ve mentioned there’s a love triangle in Macross. Having it resolved by the end of the series puts this show into the uncommon, if not rare, category. Further, without spoiling the resolution, Macross goes into even more rarefied company by not picking the couple that I thought was the likely outcome. I can just imagine the meltdown on social media if Macross had been a new series that was released in 2017. There are other examples, like the climatic battle with the Zentradi occurring well before the end of the series, of when the story surprised me by going in directions I didn’t expect; however, I’m trying to keep the spoilers here to a minimum so I’m going to pass over these as well. Another thing that sets Macross apart is it’s 36 episode count. This gave the show more time then what most modern anime get to develop it’s characters and examine the interesting ideas at the core of it’s story. Yet, it still was not enough time to really touch on every idea that gets brought up during the course of the show. I know this and, nevertheless, I found it hard not to dock the show a bit for not exploring these ideas. For example, at one point in the show, the Macross ends up in deep space with no chance of being resupplied from Earth. This meant there were not an infinite number of pilots at the disposal of the Macross to fly the small defending mech spacecraft, but, in the subsequent skirmishes we see dozens of pilots get killed each time and no one seemed worried that the Macross would run out of pilots. (It would have been nice to see the military decide they needed to start training women to be pilots.) Another example, the main character, Hikaru Ichijou, is a civilian stunt pilot at the start of the show and, after deciding to join the military, he is given command of two rookie pilots after only a few sorties himself. Even born leaders aren’t perfect leaders from day one so I expected to see Hikaru have to grapple with becoming a leader and having the lives of two pilots depend on him. This didn’t happen, he was shown to be instantly the perfect squad leader. Since we are on the subject of areas where Macross could have been better, I want to bring up the animation. Now before anyone gets angry at me, let me explain. Yes, the show is 35 years old but my issue with the animation is not one of quality. There were several instances where I, as a person watching in 2017, was wowed by the animation. This includes a sequence in the OP that so mesmerized me that I did not skip watching the OP in any of the 36 episodes. Yes, the character designs and such are dated but I quickly got used to them and it was pleasant to not see poorly done CG being shoehorned into the show. No, my problem is there was a great many instances of footage recycling. There was probably never a time in anime’s history when budget and scheduling issues didn’t force some compromises on an anime production. So, I can understand why I might see the same scene of an exploding ship being used in at least five different episodes. Understanding, though, does not lessen the lost sense of immersion one feels when this corner-cutting pulls the viewer out and reminds them they are watching a show. A search of the Sakugabooru reveals the scene from the OP I was talking about. I just loved that ending part where the camera followed the mech as it ran down the street. One can tell the mech’s gun has actual weight and heft just by how it’s animated, which is really cool. And this scene below just took my breath away. I mean that almost literally because I forgot to breathe the first time I saw it. To my eye, this might be one of the best animated scenes in all of anime. One area that lost none of it’s luster after 35 years was the music. This is especially important since so much of the story relies on the singing talent of Minmay Lynn. I was not surprised to learn that the voice of Minmay, Mari Iijima, went on to have a very successful music career as a singer-songwriter. The songs themselves are largely standard sounding J-Pop songs with lyrics that can feel a bit cheesy. That sounds like a knock against the songs, but, it’s not. Most of the songs where created to fit into the story and a popular idol singer would be singing crowd pleasing J-Pop songs. 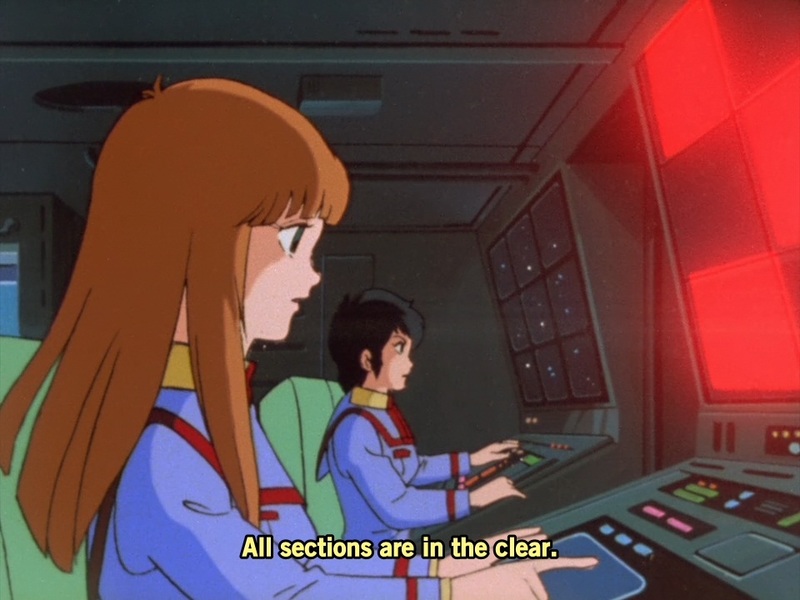 For instance, her first hit single in the show – “My Boyfriend’s a Pilot” – was first performed on the Macross when morale was low and people needed something to lift their spirits and get them more committed to fighting the Zentradi. It’s starts off with “Kyuun kyuun / Kyuun kyuun” or “Whoosh whoosh / Whoosh whoosh” and goes from there. I never got tired of hearing these songs which is a pretty good determiner of a quality song. The opening song, though not sung by Mari Iijima, was also a treat. It reminded me of the opening to Space Battleship Yamato when the singer sang with great gusto “Macross Macross” at the end of each verse. 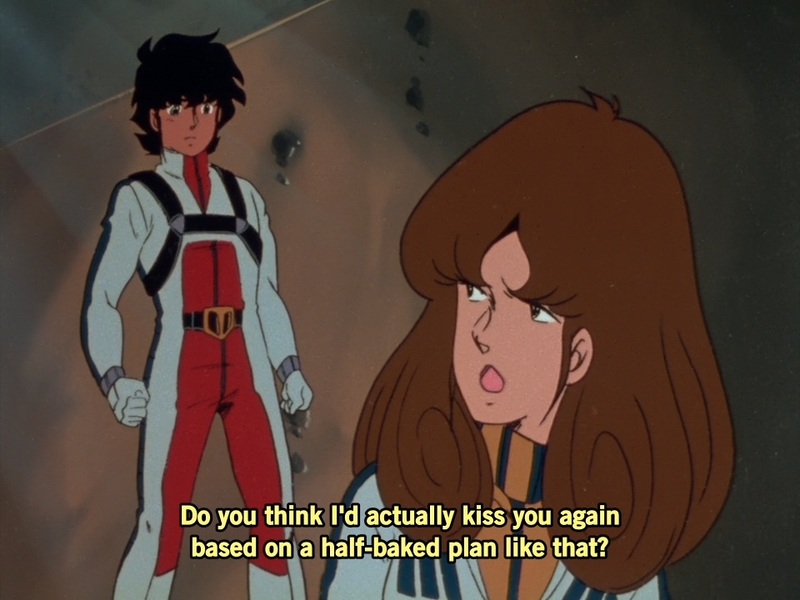 For the most part, I often forgot I was watching a 35 year old anime; however, occasionally I came across something that made me realize the difference between when this first aired and when I watched it. One such item was when Minmay talked to her parents (she’d been living with her aunt and uncle) about becoming an idol. They were not pleased. They feared she’d up becoming a comfort woman. I about fell out of my chair when I heard/read this. Beyond the slap down towards being an idol, I’ve never seen an anime that acknowledges the existence of this deplorable practice of the Japanese from WWII. And I probably won’t see it again, unless it’s an older anime, because it gets easier to forget something like this happened when time begins to take more and more of the victims. Another example was when a female character was shown wishing to be married and being the mother of a baby. I can’t remember the last time I saw a female character being shown to want a baby. (Nor can I remember the last time I saw a male character being shown wanting to get married and becoming a father.) A third instance of being shocked was when Macross showed Hikaru Ichijou getting drunk enough at a bar that the bartender tells him he’d had enough and then showing him driving to the airport and then flying a plane to the next town over and treating this behavior like it was a normal, okay thing to do. I was expecting something like a Chappaquiddick incident to happen. Macross is the type of show that I can spend 2500+ words talking about and still feel like it I’ve only scratched the surface of the show. 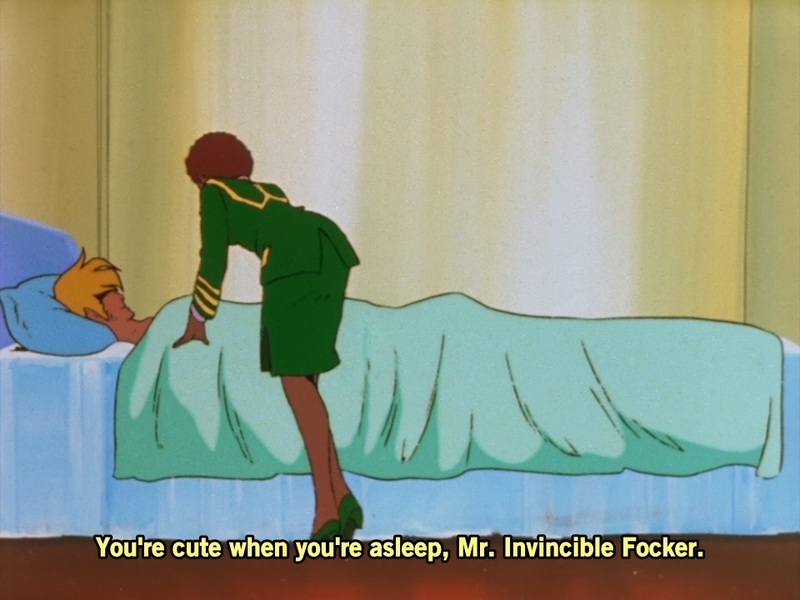 I haven’t mentioned the occasional dose of gut busting comedy that will suddenly pop up in Macross. I haven’t mentioned my favorite supporting character, Claudia LaSalle, or her relationship with Roy Focker. And I’m sure there are many other things I should have mentioned that have slipped my mind. What I won’t forget is Macross’s strong focus on the issues surrounding it’s interesting and unique first contact story. Macross wanted the viewer to understand the disruptive power culture can have on another society and it does an exceptional job of doing so. Nor will I forget the love triangle at the heart of the main character’s story. Love triangles are not my favorite feature in romance story lines, but, Macross did a good job showing how it’s love triangle got set-up and does not shy away from showing the resolution. And lastly, I will remember the music; it needed to be good enough to sell the story and it did not disappoint. I wish I could have liked the main characters, as a group, more than I did; the defects they were given – to make them feel more realistic – also made them not as likable. The supporting cast as a group was a much stronger group of characters. The use of recycled footage dragged an otherwise very solid animation effort down and blunted the impact of the occasional exceptionally well animated scene. There were a few ideas and situations that Macross seemed set to explore only never to do so. These are probably more noticeable (to the level that I’m mentioning them here in the conclusion) because of how well the show handles the rest of the ideas and situations. And now we’ve come to the problem with just giving a show a numeric score. I hope this review explains why I feel that Macross is simultaneously not quite a perfect show as well as being a historically important title for anime and such a singular experience that I think just about every anime fan should try watching it. Recommended? – Yes. Those who hate love triangles or dislike overly dark shows should probably steer clear of Macross, but, everyone else should give series a chance. This is the review card for Macross. I’ve given an in-depth explanation of what it all means here (still to be written) . In brief, each category, at the top, is a way I measure the overall quality of the show. The scores range from -1: below average, 0: average, 1: above average, 2: excellent, to 3: exceptional. The bottom section contains specific items that can influence the overall score upwards. A check mark indicates that I felt the show accomplished a noteworthy effort for that item. A straight tally of points earned will only approximate a final score. 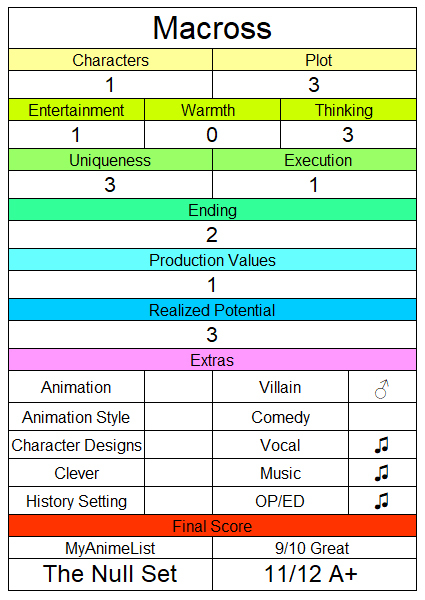 I consider the score using my grading scale here at The Null Set to be the real score a show gets and only include the MAL score to help compare reviewed titles against the broader number of series I’ve graded over at MyAnimeList. And let’s end with a funny Macross gif. I enjoyed the original Macross, but it had a lot of inconsistencies and such that really bothered me (I actually wrote a review on the series as well a few years ago, in case you’re interested), and I was not as much a fan of the characters as you seem to be. Still, I don’t regret it and it’s definitely an important series to have under one’s belt, as an anime fan. Have you watched Macross Plus yet? If not, you definitely should. It’s a four-episode OVA and it’s beautiful, and the story is excellent. Macross Zero is pretty good as well (another short OVA series). Macross Frontier is utter crap, stay away (at least, I thought so, but I know I’m in the minority with that opinion). @crakthesky: Sorry about the slow response. Been busy with Christmas related stuff and tend to avoid my blog when I don’t have the time to give it the time that it needs. There are characters that I like because they are likeable. I liked a number of the side characters in Macross because they were likeable. There are characters that aren’t likeable but are well constructed and excel in the role the show gives them. I appreciated the importance of characters like Minmay to the story. I appreciated the willingness of the creators to make characters that are not designed to be liked by the audience because it’s more “real” that way. But I should have more explicitly stated the difference between the two categories of characters. I will get to the rest of Macross someday. I read so many divergent opinions about the franchise that it’s probably safer to just watch it all without trying to skip the bad stuff.